Problem:- Calculate gross salary in Java or Calculate Net Salary Calculate Gross salary Deduction or Program To Calculate And Display Employee Salary or Java Program to Calculate Salary of an Employee or Write A C Program For Find The Gross Salary Of An Employee .gross salary is different from Net, Salary gross salary calculated annual basis we can calculate a gross salary by using the following formula (Gross salary = Net Salary - Deduction. ). Check This:- Hacker rank solution for C++ Domain. Gross Salary = Basic + Da + Hra + Ma. iv) after calculating total salary deduct 13% GST in case that salary is 15000 or above. deduct 15% GST and in case that salary is 22000 or above. Calculate net salary according to above condition and display it. Create a program that will compute the salary deduction of an employee base on the given range. 1. A method that will get the user input. 2. 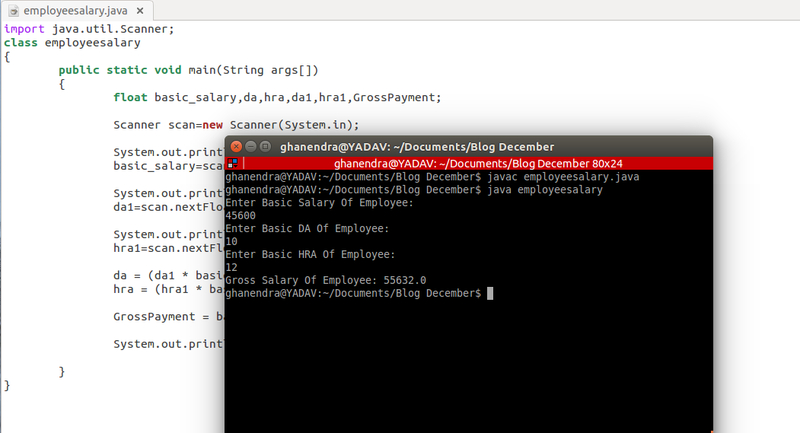 Create a method that will deduct the tax from the employee's salary. -The Compute method's body should contain a chain method. The method salary and name should be invoked inside the compute method. 3. The program should loop through a Try again question.